All of our wooden packaging products are made from ISPM 15 certified heat treated timber. But what exactly does that mean? ISPM standards for the International Standard for Phytosanitary Measures – and ISPM 15 is number 15 of these measures. It was introduced in 1995 by the World Trade Organisation, and deals with policies relating to animal and plant health (known as phytosanitation), pests and diseases, as well as food safety. It was originally developed by the Food and Agriculture Organisation to prevent and control the spread of pests which affect plants and plant products, including cultivated plants and natural flora. It also covers indirect damage, such as in the case of weeds. The certification means that the phytosanitary import requirements have been met, and it can only be provided by a certification official who has been authorised by the National Plant Protection Organisation. Any wood materials which are used to transport goods between countries and are thicker than 6mm must meet ISPM 15 regulations. This includes pallets, dunnages, crates, cable drums, spools, packing cases and boxes, whether they are made from softwood (coniferous) or hardwood (non-coniferous). The standard does not apply to products which are made from hardboard, plywood or other wood panel products, paper and plastic. ISPM 15 primarily deals with the treatment of wood packaging products to prevent the international spread of pests. Until 2010 there were two acceptable methods of treatment; heat treatment and methyl bromide chemical treatment. Although methyl bromide was quite effective it was banned in the EU in 2010 as an ozone-depleting substance which is also dangerous to humans. Some older wooden packaging may have the MB mark for methyl bromide which is acceptable to use, but crates after the date of the decision shouldn’t be treated chemically. Heat treatment requires that the wood is heated through to the core at 56 °C for a minimum of thirty minutes. Until 2009 there were no international regulations on the amount of bark permitted on wood packaging products, but under a revision in that year all materials must be made from debarked wood. Debarking is different from bark-free wood, which requires a complete absence of bark; a piece of wood is considered debarked if it has any pieces of bark which are less than 3cm in width, or if the surface area of the bark is less than 50cm2. The point of debarking wood is to prevent re-infestation of the timber after its heat treatment. It is mostly designed to repel pests who prefer barked wood such as the Great Spruce bark beetle and the Oak pinhole borer. If a packing product arrives in its destination country without a certified stamp the country has the right to heat treat, debark, bury, chip or even completely destroy the packaging and its contents – at the expense of the sender! It simply isn’t worth risking non-compliance. 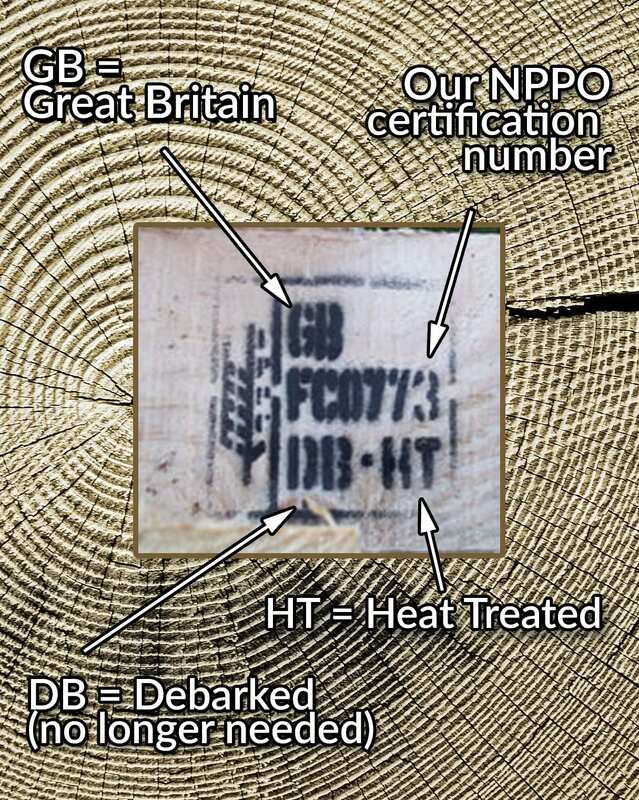 All ISPM 15 compliant packaging products must have what is colloquially known as the “wheat stamp”. 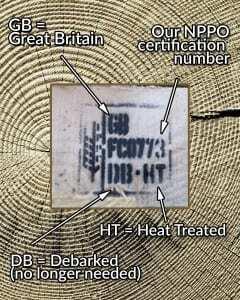 It must feature the IPPC certification symbol, the two letter ISO code of the country it comes from, the NPPO’s unique certification number, a code to specify the treatment type and any other information necessary – in this case it is marked for “debarked” although now that this is a required standard the marking is no longer necessary. You can see here how we mark our own products. How Does A Company Become Official? In order to become an Authorised Certification Official, the NPPO must accredit you to give out certificates. The assessment for this process looks at the sources and types of wood used, the treatment methods and standards to which they are reached, the facilities to segregate treated from non-treated woods, and whether a designated person is aware of the marking requirements, treatment requirements, type of wood and how to spot the early signs of live pests. The certificate needs to be renewed every six months so standards need to be constantly upheld. What Problems Does It Prevent? Some threats are very serious to woodlands, others are merely an inconvenience. These range from funguses such as chalara dieback which can be fatal to ash trees, Sweet Chestnut blight which killed around 3.5 billion trees when it first made it to the USA from Asia, and phytophthora kernoviae which affects a huge number of plants, trees and bushes including many native British species. You may have heard of Dutch Elm disease, a fast-spreading elm infection which caused a loss of between 10% and 40% in Europe during the early 20th century, and destroyed 20 million out of the 30 million elm trees in the UK when it emerged again in the 1960s. The larvae of many beetles are damaging to trees and can be easily transported through wooden packing – it’s thought that is how the Asian emerald Ash borer made it to North America, and how the Asian longhorn beetle made it to west England. Some culprits are also harmful to human beings and animals, including the Pine and Oak processionary moths which can cause rashes and allergic reactions. The following countries apply the ISPM 15 to all of their imported packaging – the only exception is with products shipped between the USA and Canada. This list is correct as of December 2014 but an up-to-date list is held at Timcon. Argentina, Australia, Bangladesh, Bolivia, Brazil, Canada, Chile, China, Colombia, Costa Rica, Cuba, Dominican Republic, Ecuador, Egypt, EU, Portugal, Guatemala, Guyana, Honduras, Hong Kong, India, Indonesia, Israel, Jamaica, Japan, Jordan, Lebanon, Malaysia, Mexico, New Zealand, Nicaragua, Nigeria, Norway, Oman, Paraguay, Peru, Philippines, Republic of Korea, Russia, Seychelles, South Africa, Sri Lanka, Switzerland, Syria, Taiwan, Turkey, Ukraine and the USA. What Can You Do To Prevent Spread Within The UK? When you visit the countryside, it’s easy to transfer pests and diseases between trees. You can prevent this by thoroughly cleaning any mud from your boots, car or bikes before leaving, by not dumping garden waste in the countryside and not taking plants or cuttings away. Look out for signs of pests and disease and report them when necessary – catching them early could save the tree.